We’re not sure why, but the flies are worse than usual here this summer. They’re driving us all crazy. The boys have coped with frequent dust baths and applications of fly spray. The straw that finally broke the camel’s back last week was finding pus accumulating in the corners of Bernard’s eyes. I wasn’t about to stand for that, so wonderful Don ventured to the farm supply store to pick up some new accessories for the boys. I honestly don’t think I had seen fly masks on horses before moving to New Mexico. I’ll admit it… I remember being thoroughly confused about why people would put things on their horses to prevent them from seeing where they were going. Huh, silly me. I’ll also admit it’s a bit unnerving not being able to see their eyes, but the boys do seem so much more at ease. The boys took to the masks, like… well… like flies on poo. Ellsworth, are you in there? Yes, are you in there Bernard? If the boys are happy, we’re happy. No mask on Nigel yet though. Don’t you worry, buddy… your mask is ready when you are. 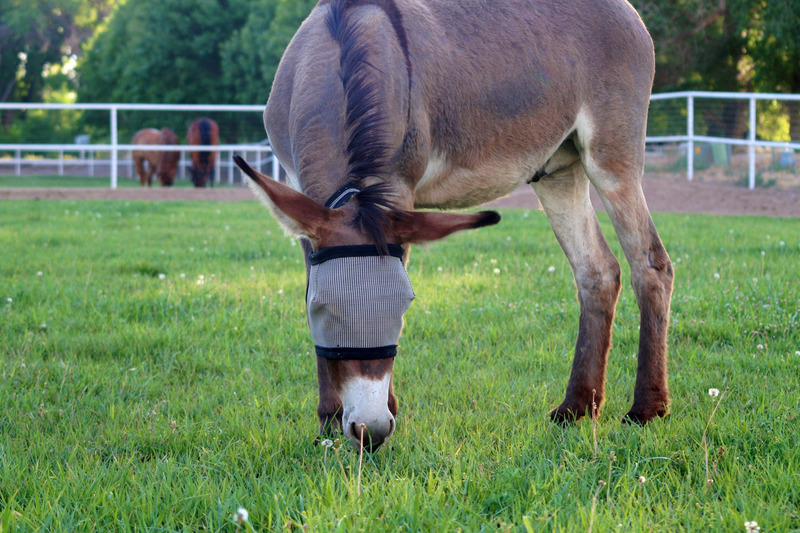 can they see through those things or do you hear a lot of “marco…polo” coming from your fields? That’s hilarious… I hadn’t thought of marco…polo! 🙂 They can see through them… we actually tried them on so we could “see what the boys would be seeing.” It’s kinda like having sunglasses on. Awww. I imagine that is quite a relief for them. I lived in a rural town in Southern Indiana for a few years and when I moved in, the door was open for the movers. They left and I looked up at the ceiling and it was covered with black flies that dove down all over me! Yikes!! That was my first encounter with them — and they bite. I wondered about Avon’s Skin so Soft because it is wonderful in repelling mesquitos for humans. I did a Goggle search for natural fly repellant for horses and lo and behold, it’s in some of the homemade recipes for horses! Who would have known it. Good luck in finding just what works for you. I love it. I was hoping that y’all would have some other suggestions for us once I posted this. Skin so Soft… yes… I hadn’t even thought about that. Definitely worth a try! Anything for relief. I’m sure the boys are happier with their eyes covered if it rids them of the horrible flies. Poor babies. I really do think the boys are happier… they certainly seem much more relaxed. Plus I don’t have to feel sorry looking at them with tears running down their faces… darn those nasty flies! I remember the first time I bought a fly mask…going in the feed store and trying it on to see how much my horse would be able see once he was wearing it. I’m very impressed that your boys are not trying to rip them off each other’s heads. They must realize how much better off they are with them on. I’m pretty sure Don tried a mask on in the store (I wasn’t there with him). Too bad (not) they were out of the ones that had a picture of sunglasses on them. The store clerk tried to sell Don a purple mask, but the good dad that he is, Don said he just couldn’t do that to one of his boys. The flies are bad this year. We just had to cut a ride short because these enormous suckers were terrorizing the horses. And we even sprayed them twice. It’s not to bad on our land because we’re using fly predators, but as soon as we step off the property, they are audacious. I’m not sure how mine would take to fly masks. I just looked up fly predators (new to me). Would they work if we religiously pick up poo? Or are there other places where one puts fly predators? You can really see fine. But I tell you, our animals communicate so much through their eyes! When I can’t see them, I feel at sort of a loss. Oh! Poor boys! Those pesky flies! 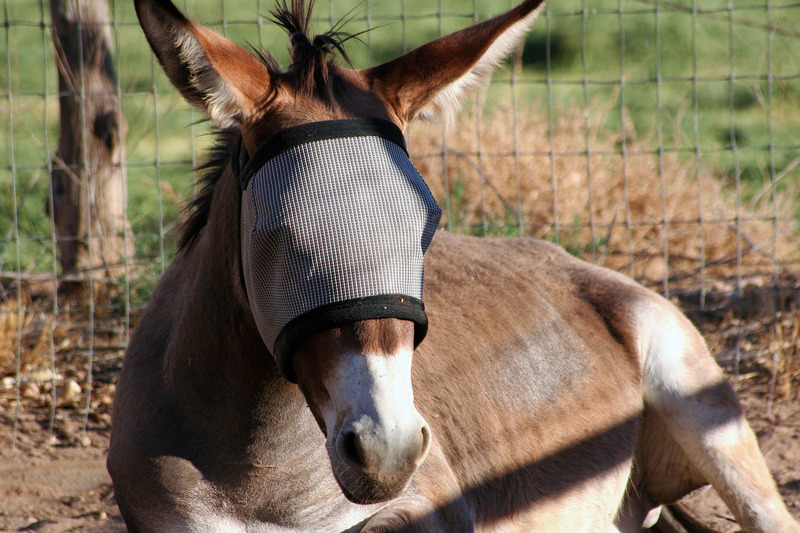 All of our horses wear fly masks and some of our rescues were very frightened of them in the beginning. I’ve spent hours walking a horse on a lead while opening and closing the velcro on a fly mask. It seems if they can follow the ‘monster’ until they muster courage they can deal better. Poor, sweet Nigel… would he allow you to use a roll on? How funny you should bring up the “velcro issue.” That’s exactly what Fergus freaked out about the first time. Once we got the mask on him and he realized how good it was, no more freaking. No roll on for Nigel either… he’s still not ready to let us touch him. He’ll come to us and will touch us with his mouth and nose, but isn’t okay with the other way around yet. 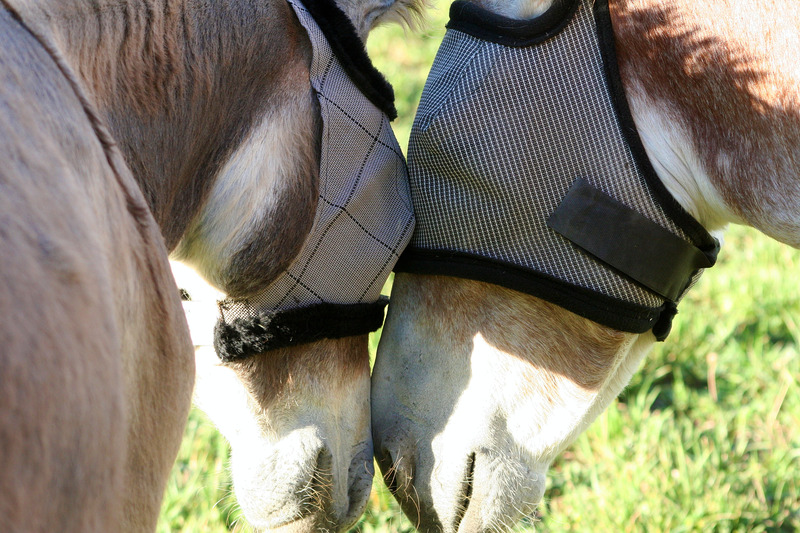 My horses all come to me and put their heads down to get their fly masks on…they love them! 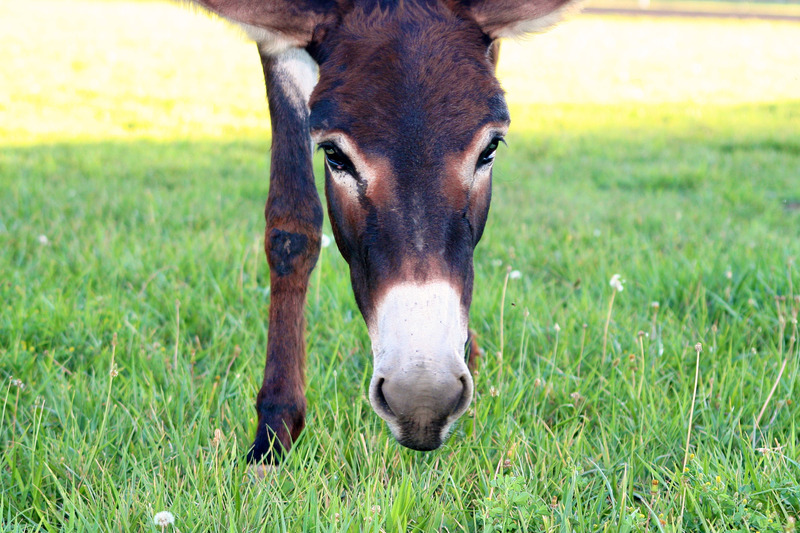 Our mini donkey had to give his a good sniff before I could put it on. Now he loves his too. His has the purple trim-it’s actually made for a mini horse-but it fits him perfectly. They are so beautiful…and it is soooo wonderful to see their gentle eyes protected from the irritation and annoyance of those little winged ones. 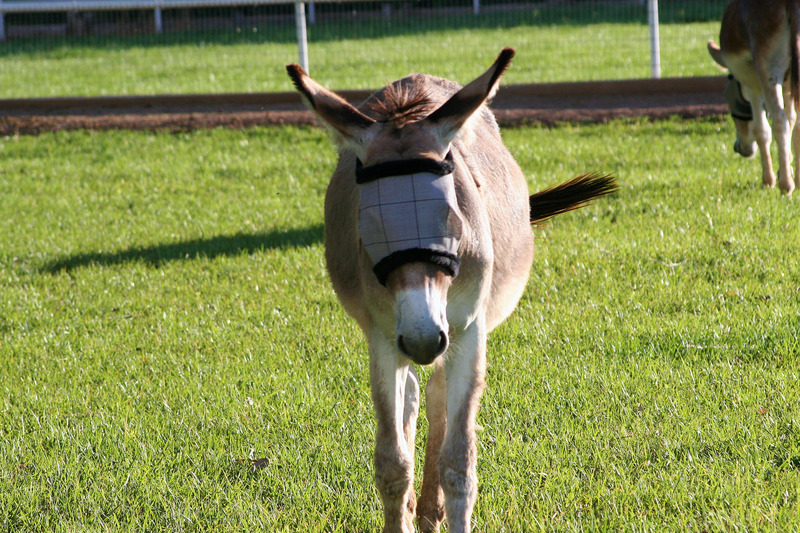 Do they make fly masks with HUGE ears for burros? The thought of it just makes me giggle for some reason! Interestingly enough, likewise here… the goats and sheep don’t seem to be bothered by the flies at all. 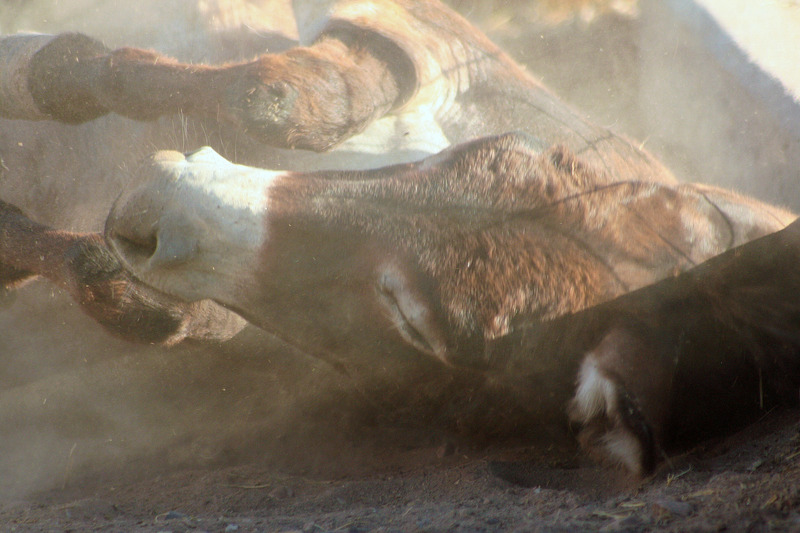 I don’t know how I missed this, but I didn’t realize that llamas take dust baths as well. I learned something new… thanks! Maybe for future use with Nigel—A horse in the barn where I kept my former horse was terrified of all fly spray and roll on. He got used to us using a gloved hand on him during the winter, so we put the fly spray on a pair of gloves and rubbed his face with it—that was what finally worked. And thanks for the tip. We’re game to try anything to help Nigel. I learned something new today. I always wondered why they wore masks. Now I know! Thanks, I hope it gets better for the boys soon. Thanks… we aim to teach once in a while! 😉 Hope you had a great 4th… I’m sure you got some awesome pictures. Aw that would be just awful having those nasty flies biting and irritating their skin & eyes. Fly masks seem wonderful! Good luck and I hope it helps. We have Icelandic horses here @ Milestones a therapeutic horseback riding center located in Kentucky, and they are allergic to the gnats that congregate on the manure. We have been using a spot on fly treatment for the last couple of years as our guys refuse the fly mask! Several different kinds on the market but we have found the Freedom brand to be the best. It last for about two weeks and you put it on just like you do flea stuff with the exception of not just on the back, you put it on the front of the forehead, at the withers, back of each leg and at the base of the tail. 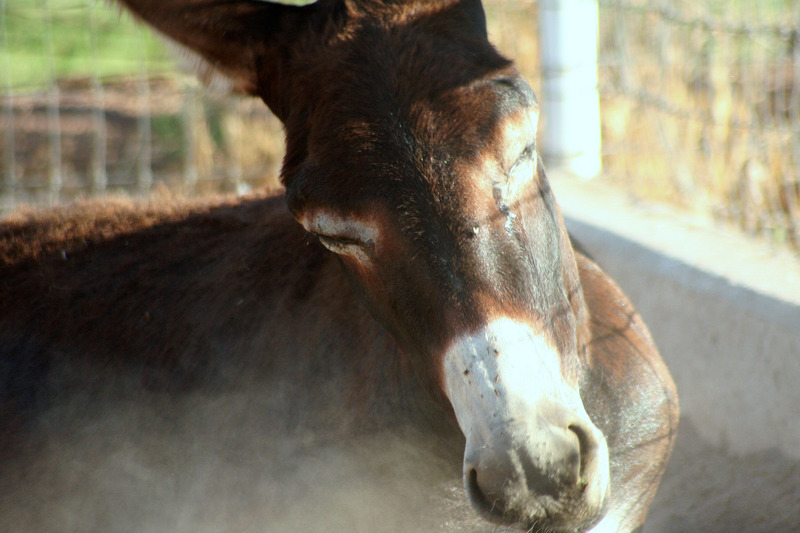 We try to not use too many chemicals, as all are special needs riders have health issues. This way they never come into contact with it and our horses stay happy. You ROCK – thanks! 🙂 I absolutely love what you do, by the way. Thanks I love it as well been with this program for 11 years would not trade it for the world! I love the post you do and the pics! Poor guys! I’m glad they (most of them) are feeling so much better in their new headgear. 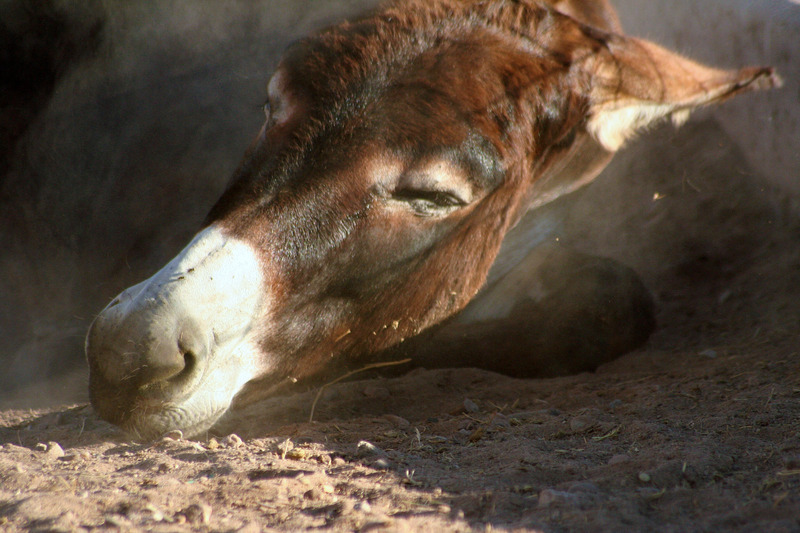 Ooooh, poor burro boys. I hate flies as I am terribly allergic to their bites. I feel bad that Nigel is not at the point where he will accept a fly mask yet. Can you douse him (from a distance) with fly spray? Probably not, since you would have to worry about hitting him in the eyes. They look like super hero’s. 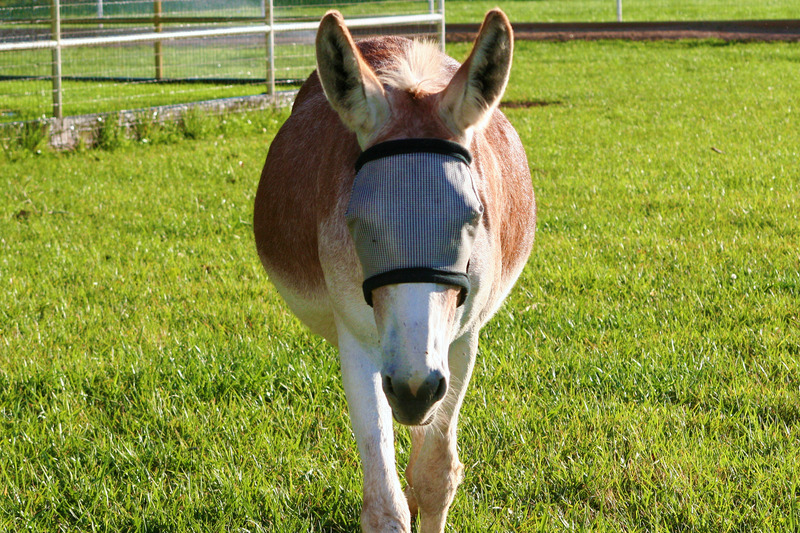 Who is that masked donkey? We swear by the fly predators. 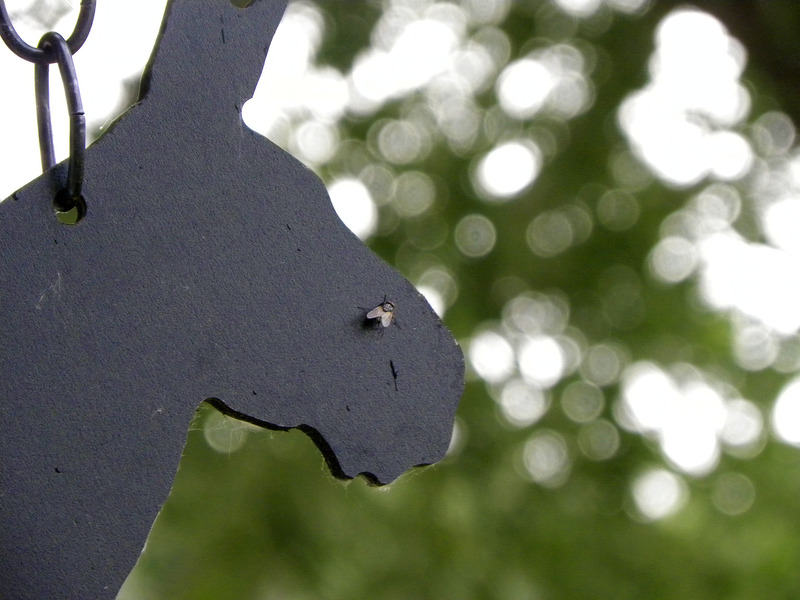 We had a real problems with flies in our “bunny barn” and didn’t have much success with other things, but after we started putting them out our fly problem was virtually eliminated. We now put them out every month in our other outbuildings and I’m still convinced that they help a bunch. Of course, they need to be replaced pretty much on a monthly basis and those #*%^ flies will start making their comeback until shortly after the next shipment arrives.